First off, it’s very surprising that Kenneth Branagh, of so many Shakespeare adaptations from the late eighties and nineties directed this. Second off, it goes to show it doesn’t matter who the director is, a film as big as Thor often gets overtaken by special effects teams and whatever signature the director has put on it has been lost. Movies this big don’t ever seem directed per se, they seem constructed by studios early on and they hire a director like Branagh to make it seem like there’s a touch of class in the picture. This guy did tons of Shakespeare movies after all. What kind of gravitas will such a man find in a comic book adaptation? Thor is another in the Marvel machine, seemingly thrust upon us so we know who the hell Thor is so that the really big movie The Avengers (the first big summer release of 2012) gets yet another advertisement. Ever since the end credits of Iron Man, we’ve been seeing pieces of the Avengers puzzle assemble, giving us notice of not one, but two movies: the inevitable origin story/summer blockbuster in the works, and the big ensemble piece coming to us in exactly one year. It’s brilliant marketing for sure. The problem is, these heroes sell themselves. Movies like Thor don’t need to be all that good; we’ve got freaking Nerd-vana in 2012 with Joss Whedon at the helm of the movie people actually want to see. 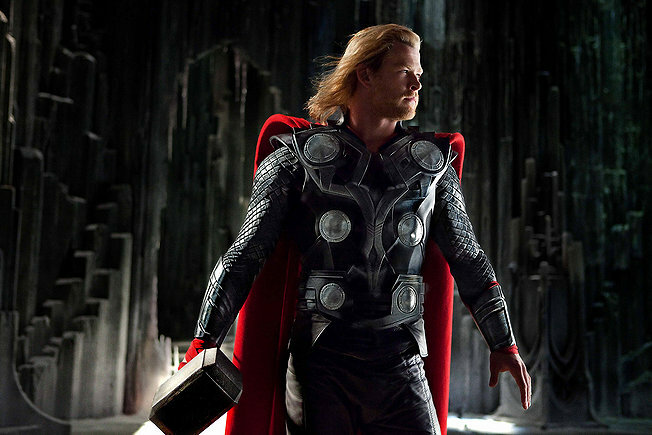 Thor starts off by showing space-time continuum researchers Jane Foster (Natalie Portman), Darcy Lewis (Kat Dennings), and Erik Selvig (Stellan Skarsgard) out in the middle of a New Mexico desert, where they happen upon the now-mortal Thor (Chris Hemsworth). Why is he mortal? Well, he pissed off his dad Odin (Anthony Hopkins) by trying to wage a war with an old enemy, the Frost Giants, despite Odin’s orders not to mess with them. Seems like this whole stirring of the old Frost Giants feud comes courtesy of Thors’ brother Loki (Tom Hiddleston), who quietly has plans of ruling the Kingdom on his own. So, after Thor gets in trouble, Odin strips him of his powers, and throws Thor and his hammer into a time-warp thingy. Apparently, only a true hero can now pick up Thor’s hammer. Thor has some learning to do. Unfortunately, the government is onto this hammer stuff, building a fortified research area around it. We’re re-acquainted with SHIELD agent Coulson (Clark Gregg), who we know from Iron Man. SHIELD is also interested in all the research of Miss Foster and takes all her notes and stuff. Thor is mortal but he still fights like a madman and he’s hunky and learning the ways of humans, so it’s easy to see why Jane starts falling for him. So, Thor has to get his hammer back and in the meantime, there are all sorts of problems being presented by his sly brother Loki, who sends an Iron Man-like monster to try to conquer Earth, while trying to get the Frost Giants interested in helping him usurp the Kingdom. Some of this is pretty good fun; I thought the best sequence involves the Frost Giants and some sort of giant, awakened creature that chases Thor and his merry band of men (and one hot woman) through a widening chasm of snow. But for the most part, being an origin story has its limits, especially since Thor spends more than half the movie without powers. And when he does have his powers, the action is little more than pounding CGI creatures with a hammer. And he flies. So it goes. There are a lot of small roles and cameos played by people such as Idris Elba, who plays an interesting dimensional guard, and Rene Russo, who is Odin’s queen Frigga, and one uncredited Oscar-nominated actor who will figure into later movies. All in all, you’ve got a decent action picture here, but little more than an appetizer for bigger things.